The record-breaking catalyst stuffs electrons - the backbone of electricity, seen here as yellow balls or yellow halos - into chemical bonds between hydrogen atoms (H) stolen from water. It uses inexpensive nickel (Ni) to do so, instead of the more common and expensive platinum. RICHLAND, Wash. — Looking to nature for their muse, researchers have used a common protein to guide the design of a material that can make energy-storing hydrogen gas. The synthetic material works 10 times faster than the original protein found in water-dwelling microbes, the researchers report in the August 12 issue of the journal Science, clocking in at 100,000 molecules of hydrogen gas every second. In addition, the natural protein, an enzyme, uses inexpensive, abundant metals in its design, which the team copied. Currently, these materials — called catalysts, because they spur reactions along — rely on expensive metals such as platinum. Electrical energy is nothing more than electrons. These same electrons are what tie atoms together when they are chemically bound to each other in molecules such as hydrogen gas. Stuffing electrons into chemical bonds is one way to store electrical energy, which is particularly important for renewable, sustainable energy sources like solar or wind power. Converting the chemical bonds back into flowing electricity when the sun isn't shining or the wind isn't blowing allows the use of the stored energy, such as in a fuel cell that runs on hydrogen. Electrons are often stored in batteries, but Bullock and his colleagues want to take advantage of the closer packing available in chemicals. "We want to store energy as densely as possible. Chemical bonds can store a huge amount of energy in a small amount of physical space," said Bullock, director of the Center for Molecular Electrocatalysis at PNNL, one of DOE's Energy Frontier Research Centers. The team also included visiting researcher Monte Helm from Fort Lewis College in Durango, Colo. Biology stores energy densely all the time. Plants use photosynthesis to store the sun's energy in chemical bonds, which people use when they eat food. And a common microbe stores energy in the bonds of hydrogen gas with the help of a protein called a hydrogenase. Because the hydrogenases found in nature don't last as long as ones that are built out of tougher chemicals (think paper versus plastic), the researchers wanted to pull out the active portion of the biological hydrogenase and redesign it with a stable chemical backbone. In this study, the researchers looked at only one small part of splitting water into hydrogen gas, like fast-forwarding to the end of a movie. Of the many steps, there's a part at the end when the catalyst has a hold of two hydrogen atoms that it has stolen from water and snaps the two together. The catalyst does this by completely dismantling some hydrogen atoms from a source such as water and moving the pieces around. Due to the simplicity of hydrogen atoms, those pieces are positively charged protons and negatively charged electrons. The catalyst arranges those pieces into just the right position so they can be put together correctly. "Two protons plus two electrons equals one molecule of hydrogen gas," says Bullock. In real life, the protons would come from water, but since the team only examined a portion of the reaction, the researchers used water stand-ins such as acids to test their catalyst. "We looked at the hydrogenase and asked what is the important part of this?" said Bullock. "The hydrogenase moves the protons around in what we call a proton relay. Where the protons go, the electrons will follow." Based on the hydrogenase's proton relay, the experimental catalyst contained regions that dangled off the main structure and attracted protons, called "pendant amines." A pendant amine moves a proton into position on the edge of the catalyst, while a nickel atom in the middle of the catalyst offers a hydrogen atom with an extra electron (that's a proton and two electrons for those counting). The pendant amine's proton is positive, while the nickel atom is holding on to a negatively charged hydrogen. Positioned close to each other, the opposites attract and the conglomerate solidifies into a molecule, forming hydrogen gas. With that plan in mind, the team built potential catalysts and tested them. On their first try, they put a bunch of pendant amines around the nickel center, thinking more would be better. Testing their catalyst, they found it didn't work very fast. An analysis of how the catalyst was moving protons and electrons around suggested too many pendant amines got in the way of the perfect reaction. An overabundance of protons made for a sticky catalyst, which pinched it and slowed the hydrogen-gas-forming reaction down. Like good gardeners, the team trimmed a few pendant amines off their catalyst, leaving only enough to make the protons stand out, ready to accept a negatively charged hydrogen atom. Testing the trimmed catalyst, the team found it performed much better than anticipated. At first they used conditions in which no water was present (remember, they used water stand-ins), and the catalyst could create hydrogen gas at a rate of about 33,000 molecules per second. That's much faster than their natural inspiration, which clocks in at around 10,000 per second. However, most real-life applications will have water around, so they added water to the reaction to see how it would perform. The catalyst ran three times as fast, creating more than 100,000 hydrogen molecules every second. The researchers think the water might help by moving protons to a more advantageous spot on the pendant amine, but they are still studying the details. Their catalyst has a drawback, however. It's fast, but it's not efficient. The catalyst runs on electricity — after all, it needs those electrons to stuff into the chemical bonds — but it requires more electricity than practical, a characteristic called the overpotential. Bullock says the team has some ideas on how to reduce the inefficiency. Also, future work will require assembling a catalyst that splits water in addition to making hydrogen gas. Even with a high overpotential, the researchers see high potential for this catalyst. 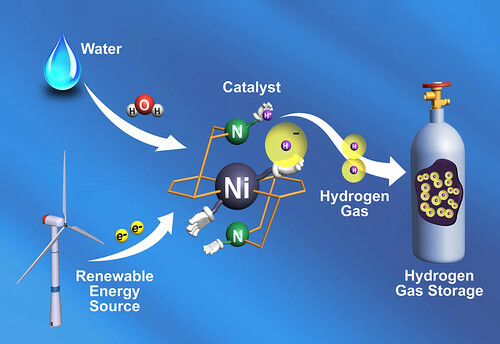 Reference: Monte L. Helm, Michael P. Stewart, R. Morris Bullock, M. Rakowski DuBois, Daniel L. DuBois, A Synthetic Nickel Electrocatalyst With a Turnover Frequency Above 100,000 s-1 for H2 Production, Science, August 12, 2011, DOI 10.1126/science.1205864 (http://www.sciencemag.org/lookup/doi/10.1126/science.1205864). The mission of the Center for Molecular Electrocatalysis is to develop a comprehensive understanding of molecular electrocatalysts that efficiently convert electrical energy into chemical bonds in fuels, or the reverse, convert chemical energy from fuels into electrical energy. To learn more about the Energy Frontier Research Centers, visit the Department of Energy's EFRC website.